Usually, going to the doctor involves a great deal of planning; filling out paperwork and remembering medical records, medical testing, and emergency treatments. And of course, a great deal of stress. However, I found it relatively comforting to have to go urgent care for a relatively normal problem. Something for once that is not associated with my chronic illness. It was a completely different experience, a normal one. So last Friday, I was having a pretty good day health-wise, so I decided to do some of the deep house cleaning that I fell behind on lately. To be honest, in general, I don’t mind cleaning as I LOVE having a clean house. But it’s hard to maintain when you’re chronically sick. First up, the master bathroom. Although we do a general cleaning often, deep scrubbing on the tub, the baseboards, and behind the toilet aren’t necessarily on the top of my priority list. Needless to say, the lack of a good scrubbing in these areas made it quite challenging. Small spaces, strong chemicals, reaching and scrubbing… my body was hating me. After scrubbing away for about an hour, my last task was the clean the tiles behind and under the toilet base (gross). I reach down and suddenly I feel intense pain in my hand. I quickly pull my hand up and see blood. What the…? I peek underneath the toilet to see what I got cut on. Sure enough, the screw that holds the toilet to the floor is uncovered and sticking straight out from the floor, covered in rust, and disgusting. I think to myself… oh my god. When did I get my last tetanus shot? I can’t remember. I was in cheerleading, I think. That was… over 10 years ago. Crap! Literally. It’s not a horrible cut, really. But it’s bleeding pretty good. Meaning I broke the skin barrier. And a rusty nail cut me… from a toilet. Yep, need to get a tetanus shot like now… but it’s 7pm on a Friday night. What do I do? Oh wait, the urgent care clinic is open until 8. So off to the urgent care clinic I went. Usually, when I go to the urgent care clinic I am barely breathing or so sick I can hardly walk. As I have probably mentioned in earlier posts, I refuse to go to the emergency room unless I know I am going to immediately die. They have ignored life-threatening problems too many times and the urgent care clinic I go to has saved my life more times than not. They know who I am as soon I come through the door and know to take me directly into triage. This visit was different because I wasn’t dying. I checked in and told them what happened. 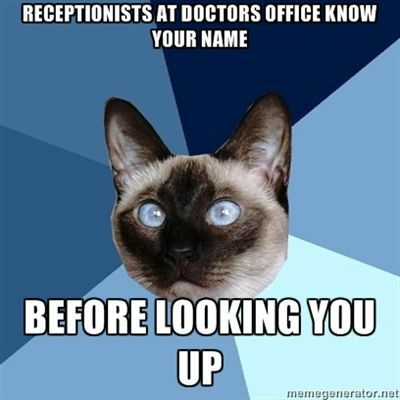 The receptionist knows me well, as she used to work at my primary care’s office and now the urgent care clinic. She asked me what happened, I tell her, “After everything I go through with my chronic illness, I refuse to go out by way of a dirty, rusty toilet screw”. She laughs. It’s not busy, so I get put right into a room. A patient room, not triage. There’s no breathing machines, oxygen, or emergency equipment. But there is a TV mounted on the wall. My husband loves this place because of the time we came in during football on a Sunday and he was still able to catch his game while I received breathing treatments. The nurse comes in, he says hello to me like an old friend. “We haven’t seen you in a while. How ARE you?” It’s almost comical to be a regular, not at the local bar like regular people, but at places like medical clinics and my pharmacy. I update him on the latest testing and findings. He’s impressed with the amount of progress that has gone on. He’ll let the doctor know, my favorite is on duty today. Oh yeah, he almost forgot… Why am I here? I tell him the story of why I need a tetanus shot. He laughs and says the doctor will be right in. A few minutes later the doc comes into the room and sits down. “How ARE you? You look good today. I see they found some diagnoses. How wonderful! How do you FEEL? I know having a chronic illness can be both mentally and physically exhausting…” I’m starting to feel like I am at a high school reunion or something. It’s amazing that they care about me and want to know what has been going on with getting a diagnosis, but it’s also a little sad, really. 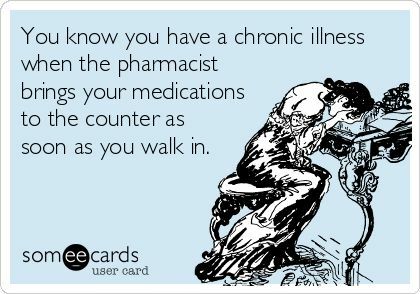 They know so much about me, my life, and my battle with chronic illness. Meanwhile, some of my own family doesn’t care to know as much as the staff here at this urgent care clinic. After catching up for a while, we finally discuss getting a tetanus shot. She agrees that it’s a good idea. I’m concerned about the side-effects, as I have not received any vaccinations since my immune system has weakened throughout the last few years or so. She advised I need to be concerned with the ‘live-virus’ vaccines, which the tetanus–diphtheria vaccine is a toxoid or inactivated toxin, so she thought there was little to no risk in experiencing complications or reactions. It’s the vaccine of choice in adults, whether as a booster shot every 10 years, or after an exposure to tetanus under some circumstances, such as cutting yourself with a rusty toilet screw. She says she’ll get the nurse and I’ll be good to go. He comes in with the needle, asking if I’m ready… Funny. Psh. I get needles bigger than that multiple times a week. He cleans my skin and then sticks the needle directly into my muscle. “Doing ok?” Of course, barely feel it, I say. “Not yet”, he replies. As he finishes up, he says I’ll need to stay 15 minutes to make sure I don’t faint or have a reaction. I’m pretty sure I am good, but I oblige. 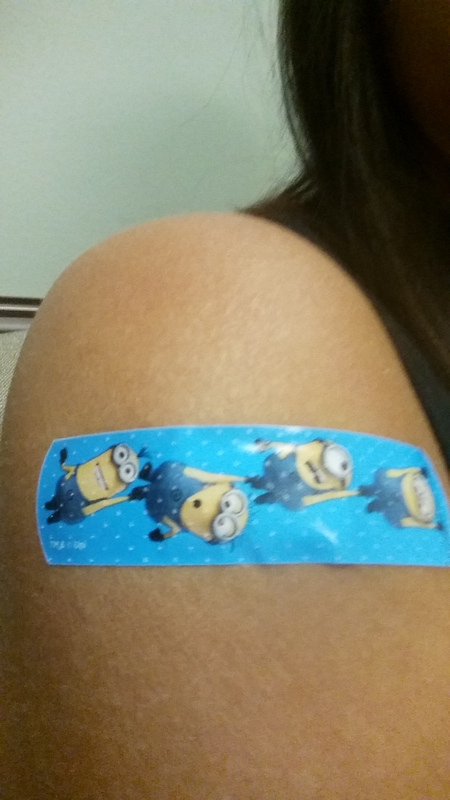 He covers the injection site with a band-aid, which he’s excited about because it’s a minion bandage and they just got them in, but unfortunately haven’t had the chance to use them on any kids as of yet – only adults. I don’t have the heart to tell him I’ve actually never seen the movies, so I smile. They’re too nice here. Plus, sometimes it’s just the little things, like special band-aids, that bring a little happiness into the world. Who am I to kill the excitement? After my time was up and no reactions had occurred, I was allowed to leave and I said goodbye to all “my friends”. I get into the car to drive home and then it starts to hit me. I look down at my arm, the muscle is twitching. Oh… now that doesn’t feel too good, I think to myself. By the time I made the 10-minute ride home, my muscle really began to ache. I couldn’t remember that kind of nagging pain from when I received the vaccine years ago but figured it would pass soon. I went home, where a couple of my friend were with my husband waiting to have dinner (the other reason I decided to clean in the first place). By the time they had left that, I could barely lift up my cup or open the door with that arm. The muscle hurt too bad and was my arm was very weak. I started to get nervous, but knew this could be a “normal” reaction. I changed into my PJ’s, specifically my “grumpy pants”, which are always appropriate for symptomatic days or hospital visits that aren’t the most pleasant. 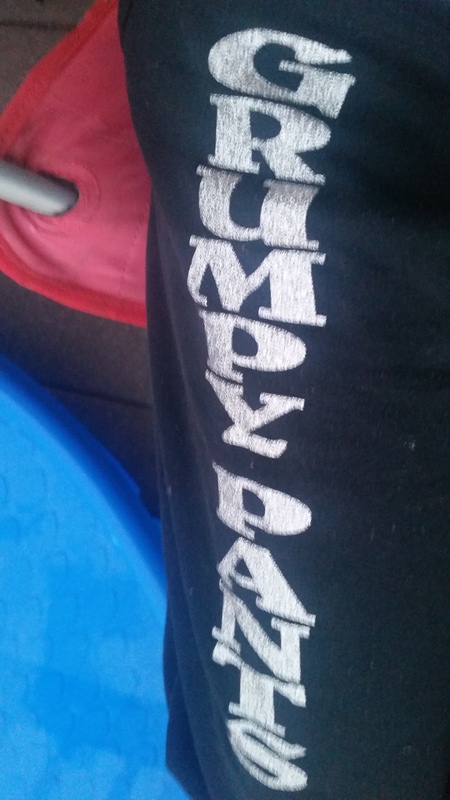 My most comfy sweatpants – “grumpy” pants. It took about three full days for the pain in my arm to go down. I also started to have a little bit of a fever, on top of a flare up of my usual symptoms. It was awful. I spent those days mostly on the couch, as I was pretty much useless. Although, I was lucky enough to have some loving company to take care of me the next few days while my body fought against me. 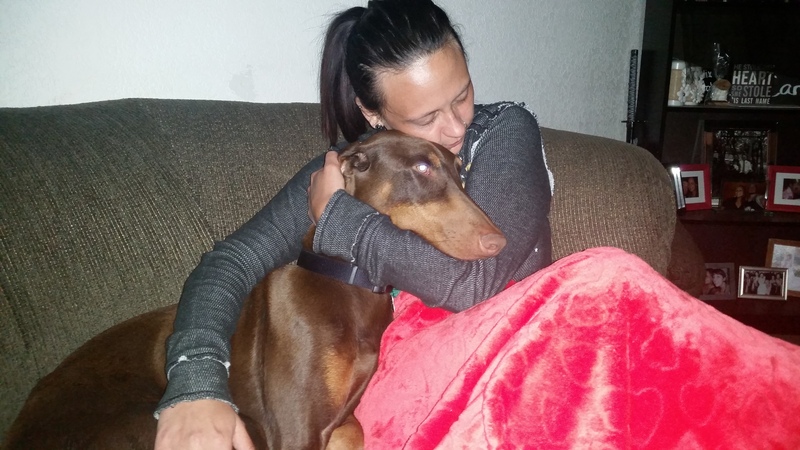 Cuddling with the foster Doberman. I’ve read that vaccines and boosters can amplify or trigger an autoimmune response, but research is so varied and I figured it was worth the risk, considering exactly what had cut me. Still, it is something I want to discuss with my doctors not in an urgent matter in case I do need boosters on other things (and not necessarily in an emergency situation). After I healed, I didn’t think about the vaccine again. That was… until yesterday, which was over a week later. I woke up to sore muscles again, only this time it seemed like it was everywhere. It hasn’t gone away yet either. The worst part, though, is that in addition to my muscles being in pain it feels like there is a raging, burning fire underneath my skin. The skin is not red or anything, but it is hot to the touch (even when I’m cold and have goosebumps). This is definitely a new symptom for me. I don’t honestly know if it is related or not, but I haven’t had any exposures to anything new. Meanwhile, I can’t decide if I should call the doctor about this (or which doctor to call about it either), so I’ve just been waiting it out. I have more medical testing this week, so maybe I’ll ask while I’m in the hospital. Essentially, the moral of the story is – don’t wait to talk to your doctors about vaccinations until it’s an emergency and/or late on a Friday afternoon. I still don’t regret getting it done, even though I had some sort of flare-up as a result. I figure it’s better than catching tetanus or having my obituary say that I died as a result of cleaning a toilet. Which got me to thinking…. If I wasn’t dealing with a chronic illness, I would never have made some amazing connections and understanding of the medical community. While it’s not always good (as you can see from many of my posts), it’s not all bad either. 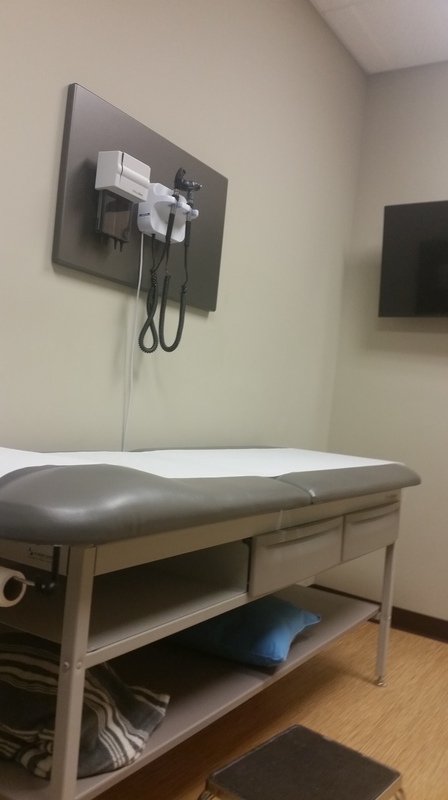 It’s moments like the one experienced at the urgent care clinic that I remember that there people in healthcare that do care about their patients and want to see them get better or get answers. They are part of the reason to keep trying, to keep educating, and to keep searching for answers. And maybe I’m not a typical patient since my conditions are truly rare, but that doesn’t mean I will always be shunned or discounted by the medical community. Or that no doctor will be able to treat me, despite the complexity of my conditions. And perhaps maybe I also come across as eccentric to my peers and others around me because I have a chronic illness. Not only that, but I do talk about it a lot, but only because feel a strong need to spread awareness to it for myself and others. Additionally, maybe some people won’t be accepting of me, or understand the course of this journey, or why I am the way I am, or do the things I do. And maybe, just maybe, my life won’t turn out the way that I expected it to. So what? 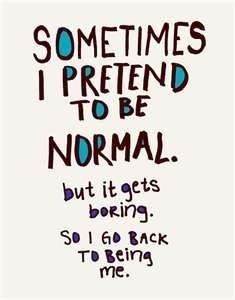 Maybe this is my normal and I’m okay with that. I’ll take this interesting, unique, complicated, and challenging life that has been selected for me. For without out it, who would I be? 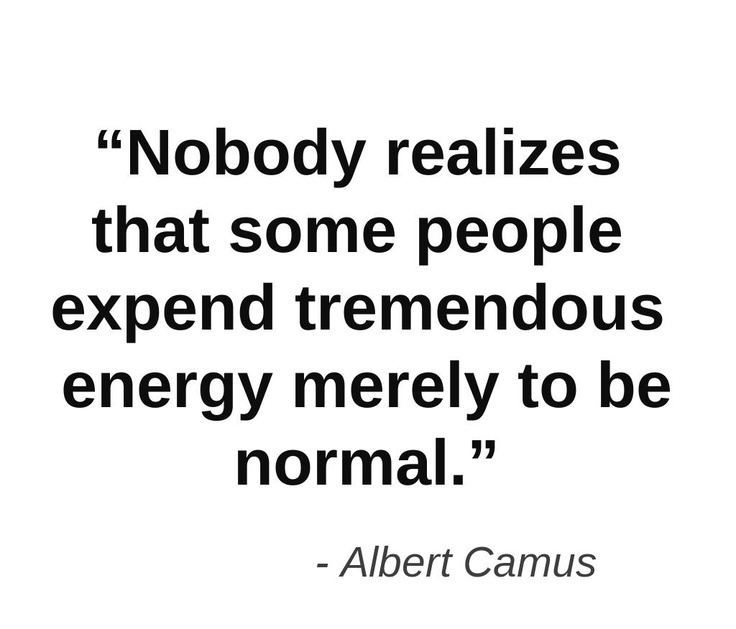 … Besides, who want’s to be normal anyway? I want to be extraordinary. I want to be a warrior. No problem feel free to take your time lol (I sure did). Praying for you! Yep, this stuff can absolutely happen with shots – but it’s usually WAY better than tetanus. Feel better!